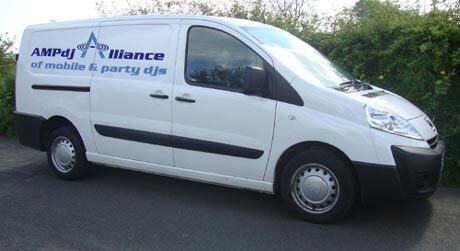 AMPdj - Meet the Team - Paul, Sandy & Amy plus the van too! Want to put a face to the name or know more about the people behind AMPdj? As well as being a full time DJ, Paul is a dab hand at web site design and anything techie and can regularly be seen wearing an anorak (only when it's cold & wet!). "It's always great to talk with colleagues in our industry, share ideas and help each other out. AMPdj is providing more & more benefits for mobile DJs and I'm extremely proud of it and our members. Our members deserve the best information & support..."
"A business never stands still and over the last nine years, as well as our rapid growth to become the largest organisation for mobile DJs in the UK, we have been busy implementing lots of new features on both the DJ and client sites." "Work in = results out and it's extremely gratifying to see the tangible rewards for our efforts, with 100s of client enquiries coming in every month. Members up and down the country are reporting tremendous success rates in converting these enquiries into bookings, making their initial £49 investment for membership worth £1,000s to them!" 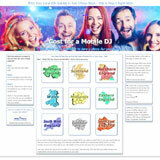 Sandy is also a full time mobile DJ and has vast experience in marketing and business. She writes most of the content for the Mobile DJ newsletters, analyses all the sites for SEO and filters Paul's mad ideas before they reach Amy. 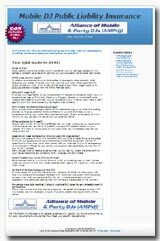 "I too am very proud of AMPdj and thoroughly enjoy the contact and good vibes we receive from our many members on a daily basis"
"Particularly pleasing is the increasing number of subscribers to our monthly newsletters (now over 7,000) and also the many positive comments from our readers who have found them useful. I appreciate that not every issue will be applicable to everyone, but by covering different aspects of our business and the DJ industry in general, I want to make them as broad and wide ranging as possible. Some of the content has been in direct response to readers suggestions and these are always welcome"
"This year has seen our 5 client sites climbing up the proverbial internet search ladders, resulting in a continued increase in client enquiries for our members. 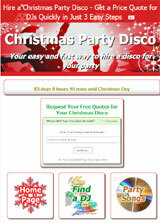 It is satisfying to see our sites coming up high for mobile disco searches around the country. SEO is time consuming, but I intend to continue the work to keep our sites on the 'high street'." Amy, the AMPdj secretary, is employed for her office & IT skills as she can't mix and doesn't know an IEC from an XLR. She is responsible for taking Paul & Sandy's ideas and putting them into action. She dreads Mondays because she knows that over the weekend they'll have come up with some new ones for her to research and implement. "I know it's a tall order but I am managing to keep these two in check - not easy!" I'm DJ Hank, the star and public face of AMPdj. Before I joined the team AMPdj was just ambling along. Now, with my vision and direction, it has over 5,000 members and is growing daily. "I'm in great demand to make personal appearances and films so don't be surprised if I'm not available to answer the phone when you call."